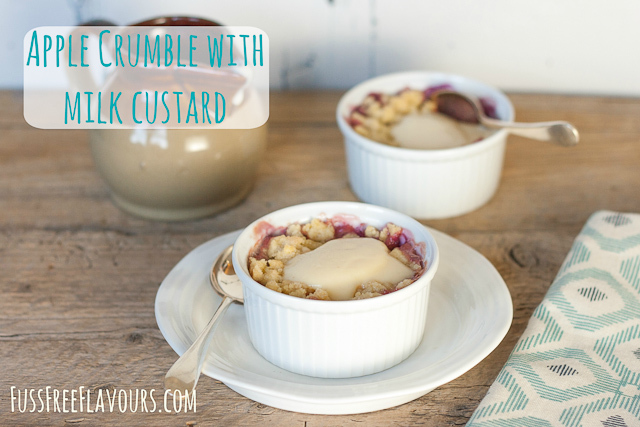 The classic apple crumble served with a jug of custard, is a simple and satisfying pudding. The addition black or blueberries brings extra flavour and turns the juice a glorious purple. Making the crumble with melted non-dairy spread is both quicker and easier than the rubbing in method. Making custard with a2 milk, rather than cream requires some care, but is still fairly easy, and means that if you cannot have regular cow’ milk you need not miss out on custard. (Read more about a2 milk here). 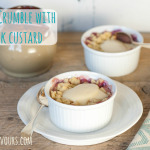 For more crumbles you make like my vegan apple and mixed berry crumble. If you try this Apple crumble with milk custard please tag #FussFreeFlavours on Instagram or Twitter. It is amazing for me when for me when you make one of my recipes and I really do love to see them. You can also share it on my Facebook page. Please pin this recipe to Pinterest too! Thanks for reading Fuss Free Flavours! Enjoy the traditional British favourite. It's easier to make than you might think. Put the flour and sugar into a bowl and mix well. Pour over the melted spread and ix well. Use your fingers to rub until the mixture resembles breadcrumbs. Arrange the fruit into a 24cm oven proof dish, or individual ramekin dishes, then sprinkle the remaining sugar over. Top with the crumble. Bake in the oven for 30 – 35 minutes until the crumble has browned and the fruit is bubbling. Separate the egg yolks removing as much of the white as you can, the best way to do this is to hold the yolk in your hand and let the white drip away. Place the yolks in a bowl with the sugar and beat with an electric whisk until pale and fluffy. Heat the milk to a simmer then slowly pour into the egg yolk and sugar mixture, whisking all the time. Return the mixture to the pan, add the vanilla essence and cornflour mix and gently cook stirring all the time, until thickened. The crumble mixture freezes well, and can be used from frozen. Make a double batch or freeze any spare.